At the edge of the market town of Sudbury, this traditional family-run local pub offers en suite accommodation, a friendly atmosphere, free Wi-Fi and free parking. 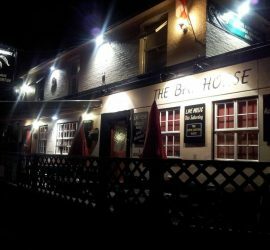 The Bay Horse is within walking distance of Sudbury’s town centre and is situated on the main Bury St Edmunds road, the A134. The Bay Horse is run by your hosts, Charlie and Micaela, who pride themselves on offering a relaxed, friendly atmosphere and comfortable en suite accommodation. The rooms are located to the rear of the pub, separate from the main building. Each room has a TV with Freeview digital channels, a hairdryer and tea/coffee making facilities. Free Wi-Fi wireless internet access is available throughout. All rooms are on ground floor level. Whilst we are unable to offer breakfast there is a very nice cafe a minutes walk that serves from 7am monday to saturday and 9am on a sunday. At the front of the pub, there is a covered and heated patio area for the cooler nights. There is also a substantial garden at the back of the building for the warmer summer days. We are a 30 – 45 minute drive from Stansted airport, not to be confused with Stanstead village which is only 4 miles away. The pub hosts live music every Saturday night.